Next week, the G-20 Leaders will meet in Antalya, Turkey, to continue their conversation about the importance of financial inclusion in achieving strong, sustainable, balanced economic growth. One item on the agenda will be the cost of remittances. In 2009, G-8 Leaders set a goal of reducing remittance costs to 5 percent within 5 years, roughly a 5 percentage point decrease. Instead, the cost of sending remittances from G-20 countries to “high risk” countries has stayed almost flat, and to “less risky” countries, has decreased slightly more than 1 percentage point. Last week, the Financial Stability Board (FSB) — which coordinates and reviews the work of the international standard setting bodies in the area of financial regulation — published a report to the G-20 stating that in a survey carried out by the World Bank, roughly half of emerging market and developing economies have experienced a decline in correspondent banking services, which allows for banks to make and receive international payments. In other words, despite the laudable G-20 policy goal of achieving more inclusive economic growth, there appears to be a disturbing trend of banking services declining or, at least, not becoming more cost effective for some countries. Why do we see these trends in remittance costs and correspondent banking relationships? A new CGD report — the outcome of a working group of policymakers, academics and individuals from the private sector — says that one reason (and we emphasize that it is not the only driver) might be that these trends are the unintended consequences of anti–money laundering / combating the financing of terror (AML/CFT) policies in rich countries. Under current AML/CFT rules, banks are asked to prevent sanctions violations and assess and mitigate money laundering and terrorist financing risks, or face penalties. However, regulators sometimes send mixed signals about whether and how banks and other entities should manage these risks, which can result in simplistic risk assessment methodologies being applied by these entities. There may also be a chilling effect resulting from the imposition of legitimate fines on some large banks for egregious contraventions of AML/CFT rules and, particularly, sanctions laws. These factors, along with others, have led banks to adopt an understandably conservative position. This includes exiting from providing services to firms, market segments and countries that are seen as higher risk, including money transmitters, banks in poor countries and non-profit organizations. Let us illustrate our findings with an example. 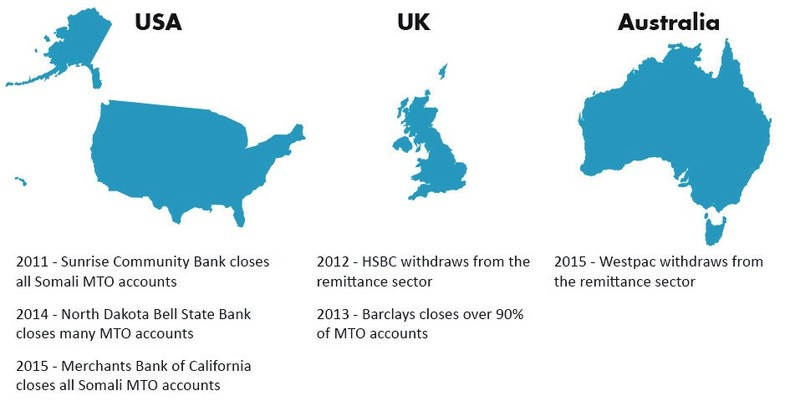 In 2013, Barclays closed the accounts of nearly 90% of its UK-based money transfer organizations. It was the last large bank in the country willing to provide accounts to the money remitters that are a lifeline for migrants trying to send funds to families in poor countries. This wasn’t the first time that a bank decided to withdraw nearly wholesale from the remittances sector — a process known as ‘de-risking’ (see Figure 1). Nor will it be the last. Such unintended consequences are causing concern at the highest levels: both Federal Reserve Chairwoman Janet Yellen and Bank of England Governor and Financial Stability Board Chairman Mark Carney acknowledge the very real problems of de-risking. Standards setters, such as the Financial Action Task Force (FATF, the global standard setting body for AML/CFT), and regulators have acknowledged the existence of de-risking and are starting to work to address it. In the meantime, the losers are manifold. People in post-disaster or conflict situations. Vulnerable people in post-disaster or conflict situations rely on non-profit organizations to deliver humanitarian assistance. However, NPOs are reporting difficulties in carrying out operations. For instance, HSBC closed the bank account of several NPOs including the Cordoba Foundation, a think tank that receives money from the UK government for work to prevent terrorism, saying only that continuing to bank the organization ‘fell outside the bank’s risk appetite’. Small to medium-sized firms. These enterprises are crucial to the economy in poor countries but they often lack the credit they need to conduct operations, grow their businesses, and create jobs. To get access to this credit, they often need local banks to have the ability to conduct cross-border transactions to make and receive international payments. Unfortunately, developed country banks increasingly report withdrawing correspondent banking services from banks in high-risk jurisdictions, including many poor countries, reducing their access to the global financial system. People in rich and poor countries alike. Public safety and economic stability in both rich and poor countries rely on financial regulators and law enforcement having visibility of transactions. However, such agencies increasingly find it difficult to track transactions. This is because MTOs who cannot send funds electronically begin to use potentially less transparent mechanisms like bulk currency exchanges. Transparency is also reduced when banks and businesses in poor countries have to send funds via banks operating in less transparent jurisdictions. Rigorously assess the unintended consequences of AML/CFT and sanctions enforcement at the national and the global level. The strength of the suggestive evidence detailed in the report requires a rigorous causal investigation of the unintended consequences of AML/CFT conducted by the relevant international institutions as specified in the report. Generate better data and share existing data between institutions. In order to assess unintended consequences rigorously, more and better data should be generated through private and public sector efforts that we elaborate upon in the report. Strengthen the risk-based approach. FATF should be congratulated for introducing and recently strengthening its risk-based approach. However, it needs to be implemented more extensively and more consistently. Improve compliance and clarify indicators of lower risk. Compliance procedures at many NPOs and MTOs must be improved so as to be more effective. At the same time, more needs to be done to recognize those NPOs and MTOs that do have effective systems in place, including better supervision of MTO sectors at the country level. Facilitate identification and lower the costs of compliance. National governments, banks and the World Bank should accelerate the adoption of new and existing technology such as Legal Entity Identifiers and biometric ID to facilitate lower cost customer identification, and enable “know your customer” compliance and due diligence while still protecting individual privacy. When the G-20 Leaders gather in Turkey, they will consider how the AML/CFT system can be made stronger and more effective. They should also address the unintended consequences of AML/CFT, even while preserving and strengthening national and global security.